Optus has finally brought out a 1TB plan after its competitors kickstarted the terabyte trend. The telco has introduced a new home phone and broadband bundle, the Fusion $129, which includes 1TB data allowance with capped download speeds of 256kbps after the download limit is exceeded. It also comes with unlimited standard calls to fixed lines and mobiles. iiNet, iPrimus and TPG all brought out their 1TB plans in August. TPG offered its plan at $69.95 while iiNet and iPrimus both opted to charge $99.95. The other plans in the Fusion bundle family, available on a 24-month contract, have also had their download limits bumped up with the Fusion $99 and $109 both receiving 500GB data allowance. 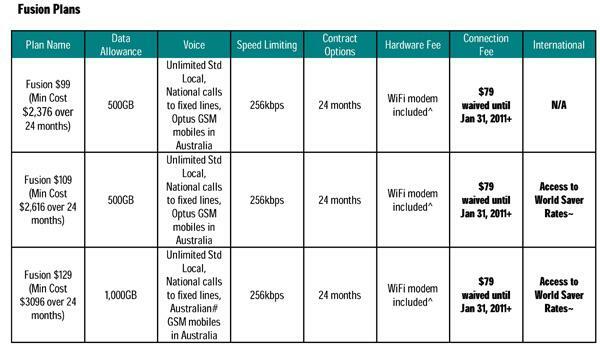 Optus is waiving connection fees on the Fusion plans until January 31.